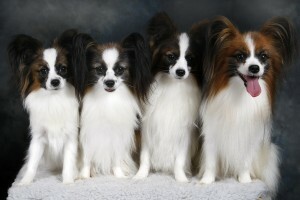 We bought our first papillon in 1980 just as a pet . Gradually we got more and more interested in learning about this kind of dog , about showing a dog and about breeding. Kennel Menine started in 1990 when we took our first litter. Already from the beginning our ambition was to produce top quality dogs. We have always been very careful in our breeding . We are just a small kennel and we want to keep it that way . In this way we are able to give our dogs lots of attention and a good home.. We want them to be part of our family. Even if we are small we have produced 30 – 40 champions who now live in many different countries. We are very proud of this and we will continue to deliver top dogs. We have also imported a few dogs in order to develope our lines. Our kind of dog is a intelligent, curious and happy dog with a body of good construction and good movements.Of course fringes and blaze gives the dog that elegant look of a butterfly.